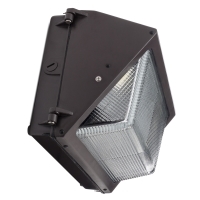 The Forward Throw LED Wall Pack from Jarvis Lighting is part of the WLFT series of lamps. It is energy efficient, consuming only 105 watts of energy, yet providing enough light through its 11,110 lumens to replace a 400 watt metal halide lamp in High Voltage settings (347-480V). The WLFT series LED wall packs from Jarvis Lighting feature heavy-duty LEDs which require less diodes to provide equal or more light. The wall pack features a prismatic lens, and pushes light away from the building. This wall pack is also durable, with rugged aluminum housings, reducing the need for constant maintenance. It lasts from 75,000 to 100,000 hours on average.